“Do you realize it is almost a year that we have been at Loud Garden?” asked Mrs. Tomato. Christopher’s face turned ashen. He became very sad all of a sudden. Music is a great tool for healing. Example: Christopher Corn was upset because this was his first anniversary after taking his own life on Earth. He wished people on Earth could hear the music he created in Loud Garden. 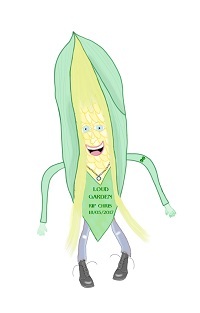 This entry was posted in Christopher Corn Stories, Christopher Corn Story Challenge 2018, Fresh Veggie Family Stories, Grade 3 Level and tagged Christopher Corn, First Anniversary, Loud Garden, music. Bookmark the permalink.